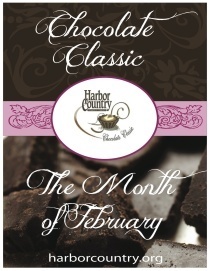 Cozy up with chocolate in Harbor Country as more than forty Harbor Country Chamber of Commerce businesses offer a variety of chocolate inducements, the entire month of February. The 4th Annual Harbor Country Chocolate Classic includes ice-sculpting, sleigh rides and creative activities for all ages. Culinary venues will offer everything from chocolate-chip pancakes, hand-made truffles, and chocolate-covered bacon, to chocolate-enhanced wine and locally brewed specialty beer – with the key ingredient of chocolate of course! Chocolate Classic retailers entice shoppers with specials on chocolate-hued items including jewelry, glass, furniture and more. Visitors can also win special prizes by participating in various chocolate-themed guessing games!